She was checking in with me about the Psych 101 quiz she'd just taken. The one she'd nervously asked me to pray about when she left for school that morning. I responded to her message by assuring her of my love and telling her it would be okay and encouraging her to just do the next thing she needed to do, the best that she could. When kids are hurting, moms want to make it better. So we pray...and pray some more. We worry...and worry some more. But there are also things we say--things that aren't new or groundbreaking but that are timeless classics for one reason: they work. 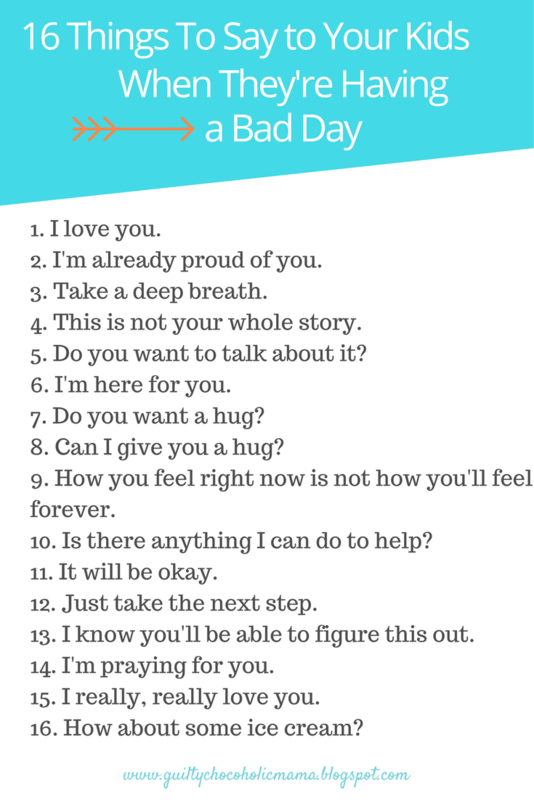 If someone who calls you "mom" is having a bad day, here are some go-to phrases you might want to have in your maternal arsenal. Don't let their simplicity undermine their power. 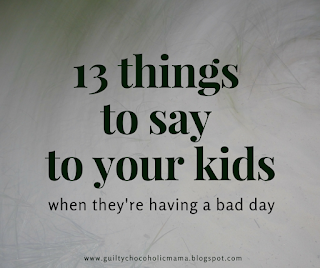 I've said these things over and over, and often, not long after I've said them, my daughters have told me, "I always feel better after I talk to you." Which is pretty much the highest mom compliment I ever hope to get. 2. I'm praying for you. 4. I'm already proud of you. 5. This is not your whole story. 6. Do you want to talk about it? 7. I'm here for you. 8. Just take the next step. 9. It will be okay. 10. I know you'll be able to figure this out. 11. Is there anything I can do to help? 12. I really, really love you. 13. How about some ice cream? 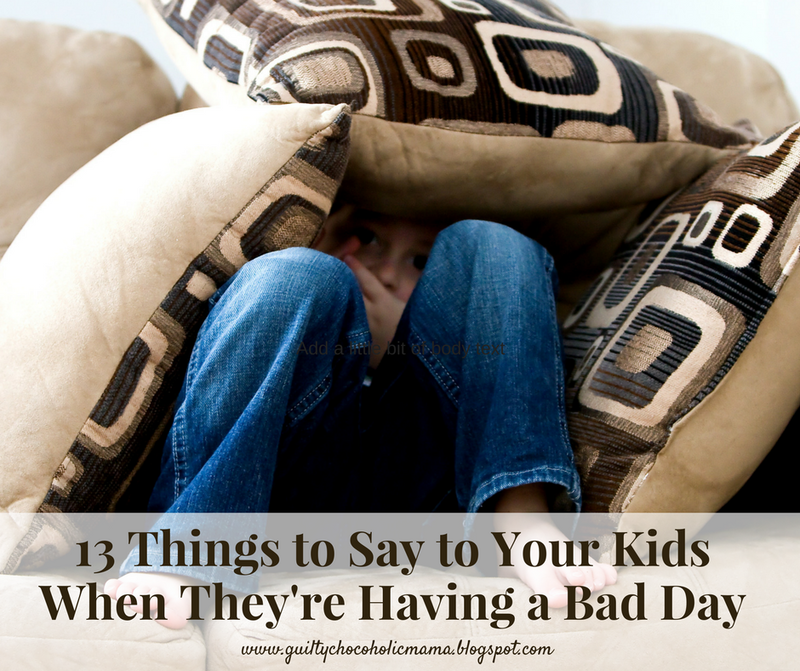 What would you add to this list, mama? Leave your wisdom here in a comment or over on Facebook. While I wait for it, I'm going to round up some ice cream. P.S. 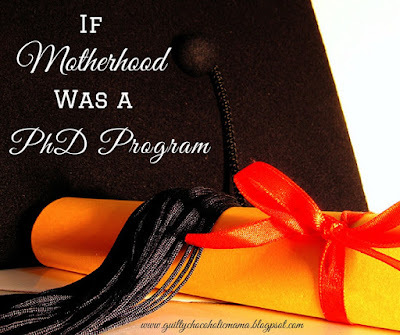 After I originally wrote and published this post, I added a few "things," necessity being the mother of invention and motherhood often necessitating invention and all that. Pin away...because mama said there'd be days like this. Sheila, I LOVE those additions! I thought about putting "can I give you a hug" on here but had not even considered the second. Perfect. Thank you so much! I love your list Elizabeth - I'm struggling with my 28 year old daughter's lack of communication (she married a man who doesn't do 'family' and has gradually pulled away). I'll be keeping all of these in mind for our next conversation - whenever that may be. Oh, Leanne, my mom heart absolutely breaks for you, reading this. I cannot imagine how hard this situation must be for you. Thank you so much for your kind words about my little list, and I pray you might be able to put something here into use soon...because I hope you'll be able to talk with your daughter again soon. Bless you. Great list! One of the toughest seasons of parenting is when the disappointments come rolling in and we can't do anything concrete to change a child's circumstances. Nothing has galvanized my prayer life like parenting young adults. Michele, I cannot imagine a better expression of truth than the one you've left here. Yes, yes, a thousand times yes. The older our kids get, the more the sources of their happiness are things we can't control. That is how it must be and should be, but that doesn't make it easy. So we do what we can and say what we can...and pray! Thank you so much for sharing your words and wisdom! It's always a blessing to visit your writing home! What a great list! I find that just holding Gv is the most helpful right now, but I know there will probably come a day when I need to rely more on words than touch! Oh my, YES...isn't that the truth! I still get my hands on my girls as much as I can, and there is still nothing that replaces it. But when we're communicating by text, as we do so often these days, I put these words to good use. You can just tuck this away for later and in the meantime gather your sweet girl to yourself every minute you can! Oh, that certainly is a mother's blessing "I always feel better after talking with you". Precious. You've developed trust and stability in your daughter's life. These are all great to share. I felt comforted just reading it. Sometimes, I can feel that NOW is not the time to talk so instead of speaking, I just sit and hold the space for him. Eventually, when he is ready, he'll open up. I'm going to adopt "just take the next step". I know when I tell myself that, it makes things less overwhelming. I love your advance planning mindset! :) Thanks so much for taking time to come visit from #MommyMoments! 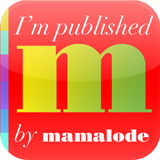 I am loving your posts and so are the readers of the Blogger's Pit Stop. We will FEATURE this post. Thanks for a fabulous list, Elizabeth!! I need to use as many of these phrases as possible as often as I can, whether verbally or by text. Especially love numbers 4 and 11...I find that the answer to "Is there anything I can do to help?" is usually "no," but I think it's a comfort to them just to know that I'm available and want to help if I can. 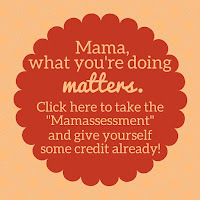 Thanks again for this great mama wisdom!! These are great! As a mom, we should be our kids’ safest place! Oh my heart...YES! Maybe so much else we try to do as moms boils down to this. Thank you so much for sharing your wisdom! I love this so much! What a perfect list. I find myself saying these same things. Love the retail therapy! I'm going to tweet this! Ahhh!! Thank you so much, Michele! Not only for your kind words but also for the reinforcement that these are universal mom sayings. We don't need to reinvent the wheel...we just have to keep pedaling it over and over. ;) And I will say that that retail therapy WORKED...my older daughter (the one who sent me the rather sad text) has hardly taken the "therapeutic coat" off since it came in the mail! :)Thanks so much for stopping by! Aw, thank you for that most lovely of compliments, Lisa! Alas, bad days seem to be no respecter of age. ;) But yes, you might want to keep them around for the teenage years. WHICH, by the way, are mostly fabulous. It's just that when they're not, well, a mama's got to have a plan. :) Thanks so much for stopping by from #FridayFrivolity! Mmmmmmmm, #5 is my fav. Good job, Mama! Aw, Jodie...I'm pretty fond of that one, too. In fact, I used it on my high school freshman this morning when I was talking to her about a tricky situation at school with a classmate who is more than an acquaintance but not really a friend. Thank you so much for visiting today! Yes! Yes! Yes! We frame worlds with our words. THIS is the most important ministry to our kids at home. Thanks for sharing! "We frame worlds with our words"! I LOVE that so much. There is so much weighty responsibility to being a mom...but so much soul-nurturing opportunity, too! Thank YOU for sharing, Alicia. You are right about making it short and sweet with just the right words. Other times it takes a few more words but still very few. Years ago my daughter was going through a tough breakup and I told her to listen to Rascal Flatts' Broken Road. I told her that I was sure their words were meant for her. She had no comment. A couple of years later she met her soulmate and it became their wedding song. Oh my goodness...YES, Cathy! I thought about that same song when my own daughter was going through a similarly tough breakup. What a beautiful, hope-inspiring story you shared here...I might have to pass it along to my daughter. ;) Thank you so much for stopping by today and for leaving this lovely feedback! Thank you, Barbara Ann! 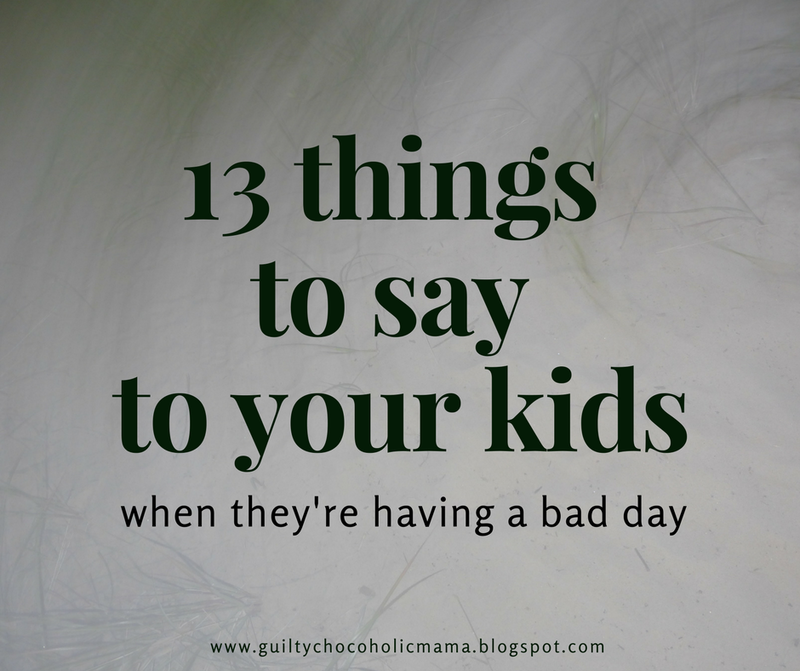 Sometimes, I wish it was possible to forget these things, because that would mean my children were not having bad days! But such is life on this earth, so at least I feel like but this gives me an arsenal to keep in my back mom pocket. Thanks so much for stopping by! These are great! Such sweet and gentle reminders. My mother's go to phrase has always been "all things happen for a reason; I'm sure it will all work out in the end." Well, thank you for sharing with us at Love to Learn. Pinned!! 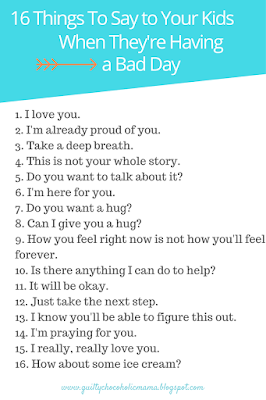 I'm a mom of three and a parent educator and I love these reminders. Congrats, you're featured this week at the This Is How We Roll Link Party. Ahhh! Thank you so, so much for that lovely honor! I really don't want these "things" to be needed, but...life. ;) Thank you for the privilege of being featured and for so faithfully hosting This Is How We Roll! I love these tips! I always told my kids to stop and breathe, then said, Let's figure out how this happened so you can try to avoid this again. Then ended with the ice cream!! Start with breathe, end with ice cream...you are one smart Dr. Momma! :) I LOVE that addition: "let's figure out how this happened so you can try to avoid this again." I'm adding that to my list. Thank you so much! Fantastic list! A hug and reminding them you love them and are their to listen if they want to talk is sometimes all that is needed. Aw, thank you so much! You are so right about the big power of simple, "little" things. They really do matter. Thank you for stopping by! An wonderful post you have published . So much thanks for this useful post .